This plaid reminds me a farmer – perhaps just because of the barn-red in it, and the fact that it’s a more traditional red and blue plaid. It appears to do up with white snaps. 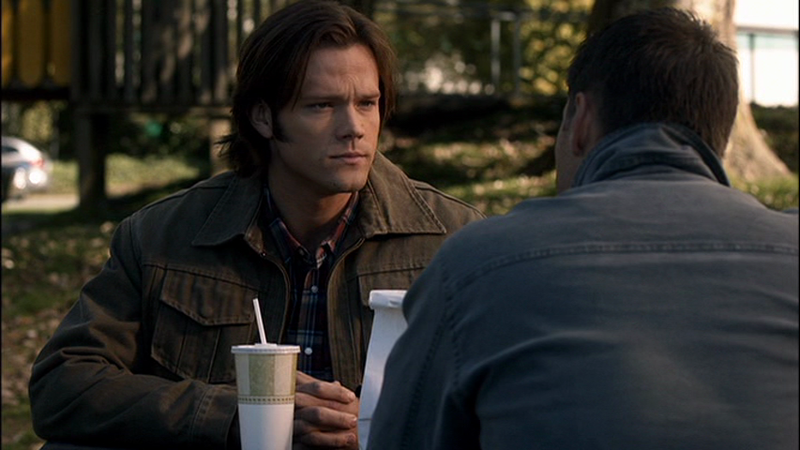 In All Dogs Go To Heaven (6x08), Sam wears it at the end of the episode while he and Dean talk on the picnic bench. In Freaks and Geeks (8x18), Sam wears this shirt at the end of the episode when saying goodbye to Krissy. Another great Sam shirt. With only having a duffle bag to put their clothes in you would think we would see some of these new shirts again and more frequently. Wonder where they stored all these new shirts Sam wore in S6. Curious minds, you know. Maybe at the Campbell compound? Best as place as any. My theory is that, like John, they have several lock-ups scattered around the country (plus perhaps the now-seemingly-abandoned Campbell compound and Bobby's) and they just leave bags of clothes scattered around (Sam's clothes especially). I like that theory. Just like they have PO boxes scattered throughout the states for mailing credit card stuff too, it might make sense for clothes as well. Just wish we would see some of the newer stuff again, instead of the same old retread. Not that I'm complaining. Dean's red shirt of angst is my favorite and the Blue and Red shirts he wears follow close behind, so I like seeing those shirts more often, but it would be nice to see some of the newer stuff every now and then.